Loans are an economic staple in most people’s lives; they can help pay for education, transportation or living arrangements. Of course, getting a good loan from the bank or some other financial institution can be quite difficult for some people. This is especially true for buyers who are just starting out and don’t yet have a sound credit score. For these individuals, seeking out a cosigner might just be the way to go. A cosigner allows people to receive a loan or transaction they otherwise wouldn’t have access to. Being a cosigner can be quite risky financially, so it’s important to know exactly when you need to ask somebody to serve as one on your behalf. Investopedia defines cosigning as “the act of signing for another person’s debt which involves a legal obligation made by the cosigner to make payment on the other person’s debt should that person default.” While the person requiring the cosigner isn’t always in debt, a payment due is always involved. In summary, a cosigner is someone who agrees to make payments on a loan if the primary recipient of said loan is unable to do so. Oftentimes, the person who takes out the loan is more than able to pay it back, but is unable to receive the original loan without someone else backing them. By having someone serve as a cosigner, individuals can gain access to much larger loans than they would have been able to by themselves. However, the Consumer Financial Protection Bureau notes that interest rates are usually much higher for individuals with a cosigner. Justin Pritchard of The Balance explains that the most common reason people require a cosigner to receive a loan is due to their credit score. If the individual has a poor credit score and history, they will be unable to receive stronger loans without the guarantee that someone with a better credit score is backing them. Several different transactions often necessitate the need of a cosigner. Some of the most common are purchasing a car and renting or buying a house. A cosigner is not necessary for just any transaction, though. Consigners should be found for important financial endeavors that are required to meet basic needs, like the aforementioned lodging or transportation. Who can serve as your cosigner? The individual who signs up to be a cosigner is required to have a strong credit history more often than not. They should have enough money saved up and have a strong enough credit score that signing up to cosign shouldn’t negatively affect them. Nevertheless, simply by serving as a cosigner, they do run the risk of hurting that credit score. For this reason most cosigners are people close to the person applying for the loan. The Consumer Financial Protection Bureau notes that most cosigners are family members and most often parents. Your lender does not designate who must be your cosigner, but will accept anyone who meets their credit standard and guidelines. What are the risks of serving as a cosigner? Signing up to be a cosigner is a decision that requires a lot of forethought. If something goes wrong with payments, it will be the cosigner’s responsibility to cover those payments. Cosigners are held to an equal amount of responsibility for paying the loan as the original person who applied for it. Despite this, Kristy Welsh noted in USA Today that lenders will often take legal action against the cosigner first if payments are not made, knowing that the cosigner probably has a larger, more reliable amount of money. Your lender will provide your cosigner with a disclosure that summarizes their obligations. 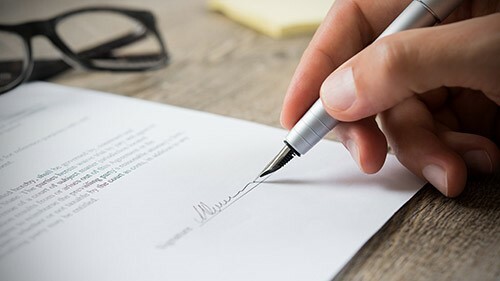 Before you consider seeking out a cosigner, it’s important to consider whether the loan you are looking to sign up for is for something that’s absolutely necessary. Settling for a smaller loan might mean settling for a smaller home or car, but it often means that neither you nor your potential cosigner will suffer serious financial burdens down the road.